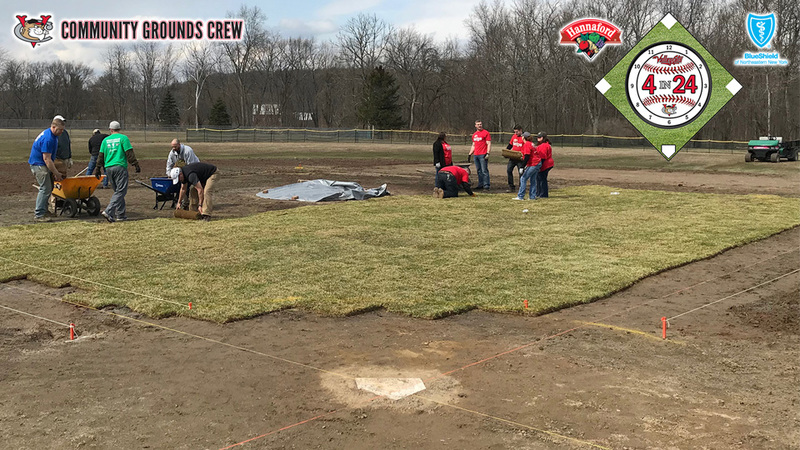 TROY, NY- The Tri-City ValleyCats and their partners, BlueShield of Northeastern New York and Hannaford Supermarkets, are set to renovate four youth ball fields on Thursday, April 11th during the 9th Annual '4 in 24' youth field renovation project. Upon completion, over 36 fields will have been revamped by this strong community initiative which has positively impacted thousands of youth ballplayers in the Capital Region and beyond. The scope of work includes laying brand new grass, rebuilding the pitcher's mound and home plate areas, grading and raking the baselines, installing a new pitching rubber, plate, bases and more. "First I want to express our gratitude to BlueShield of Northeastern New York and Hannaford Supermarkets for being tremendous partners in this initiative," said ValleyCats General Manager Matt Callahan. "We all share in the common goal of a bright future for our youth, and this project goes a long way to provide the resources to help them succeed." Both longtime supporters of the '4 in 24' project, BlueShield and Hannaford make the renovations possible through the aid of necessary monetary resources, and volunteer efforts of their staff. "With more than 30 fields renovated over the last nine years, BlueShield's commitment to the community continues to provide our region's young athletes access to healthy activities as they grow," said Nicky Chlopecki, Manager, Community Relations, BlueShield of Northeastern New York. "As a longtime partner of the Tri-City ValleyCats, our employees are eager to rebuild fields alongside the players as they work to make a positive impact in our community." "Hannaford is committed to promoting healthy lifestyles at all ages and youth sports are an ideal way to instill the importance of activity and wellness in our community's youngest members," said Hannaford Supermarkets Community Relations Specialist Brian Fabre. "We are pleased to continue this partnership with the ValleyCats and BlueShield as we provide local ball players with not only improved facilities, but also the opportunity to grow as individuals and members of a team." The efforts are also supported by Admar Construction Equipment, Brightview, Profile Products / Turface Athletics, and SiteOne Landscape Supplies, who are contributing some of the necessary equipment and materials. Additional support comes from 'Cats Care, the ValleyCats' arm of the New York-Penn League Charitable Foundation. League Information: Green Tech's baseball team currently plays their home games off site because they don't have a useable field at their high school. The ValleyCats and their partners will transform an old softball field at the school into a baseball field for their team to call home. The field will also be used for Eastern New York Travel Baseball league games. League Information: Rensselaer Little League is utilized by 150 players across 14 teams. Fideli Field has had drainage issues and is need of a leveling of the infield playing surface. The current baselines are not aligned properly, and the pitcher's mound and home plate area is in disrepair. With these renovations, the field will receive a much needed facelift to the infield surface with brand new sod, infield mix, a complete overhaul of the pitching and home plate areas, and more. League Information: The work will focus on the Majors Field at Broadalbin, a league that serves over 160 players with 13 teams. The league was in the process of flipping the current field to avoid sun glare, but was unable to finish due to bad fall weather. League Information: With 13 teams and over 180 softball players, the renovations to Field 2 at the Brunswick Girls Softball League will go a long way in maintaining a safe field for the athletes to learn and grow.